All week I have been posting my Best of 2015 products, divided into different categories. Any product that has a * beside it was a favourite last year as well. Today is my favourite lip products. You can see my favourites from last year here. Lipstick- MAC Syrup. This isn't necessarily my favourite lipstick formulation (that award still belongs to the Maybelline Matte Lipsticks) but this is definitely the lipstick I wore the most last year. It's the perfect everyday pinky shade. Lip Gloss- NYX Butter Gloss. I almost didn't include this category because I rarely wore lip gloss last year but if I ever did reach for a lip gloss I tended to use this one as a lipstick topper. Lip Crayon- Revlon Just Bitten Kissable Balm Stain* I wear this literally everyday to school. It's moisturizing, and long lasting. Lip Liner- Charlotte Tilbury Pillow Talk. The perfect my lips but better lipliner! Worn under a lipstick it does help to make the lipstick last longer and it will make you lips look fuller but I really like to wear this on it's own. Lip Scrub- E.L.F Lip Exfoliator. As this lip scrub is in a lipstick tube, I find it much less messy and easier to apply. It's also really good at moisturizing and smoothing you lips. Plus it's inexpensive. 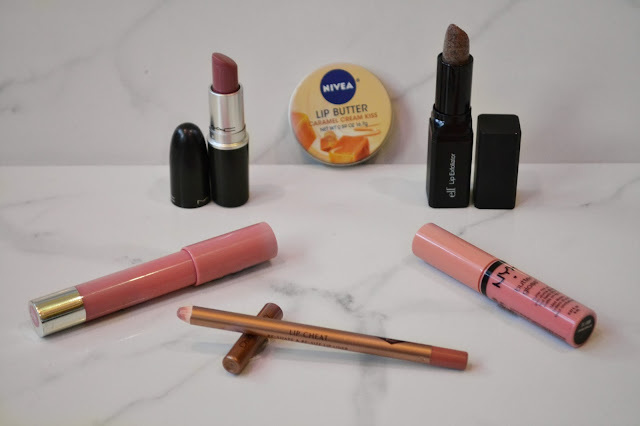 Lip Butter- Nivea Lip Butter* I only use Nivea lip balms. Although the pot is a little less hygienic than the tube, the scent of these are so good! It doesn't have any taste and it's really moisturizing. What were your favourite lip products of 2015?